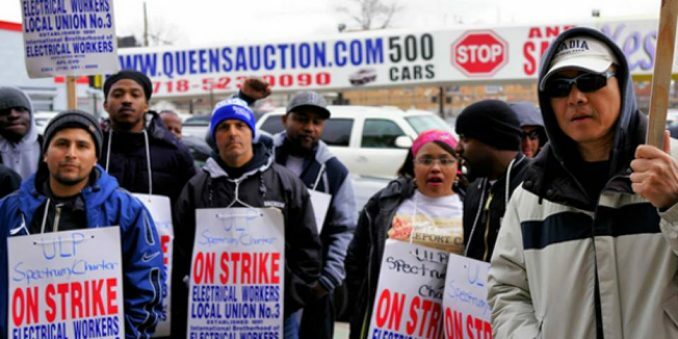 Workers in Local 3 of the Brotherhood of Electrical Workers have been striking since March 28. The nearly 1,800 workers walked off the job to protest various problems with the nation’s second largest internet provider. Charter/Spectrum has refused to negotiate a contract since Time Warner owned it in 2013, and is taking a page from the fat-cat playbook. The company is using divide-and-conquer tactics to pit its workers against workers who are its customers. Charter/Spectrum promised internet speeds knowing its equipment was old and shoddy, and now blames its workers for all the service calls they have to make in response to slow speeds. Adding insult to duplicity, Charter/Spectrum then has workers install old, refurbished equipment that is still unable to reach advertised speeds. On the ground there’s massive support for the strike on daily picket lines at the Charter/Spectrum office at 120 E. 23rd St. in Manhattan, N.Y. Elected officials in Queens wrote a joint letter to the Charter CEO in support of the union, demanding that workers not “pay for the company’s lies and misrepresentations.” New York state Attorney General Eric Schneiderman sued the company Feb. 2 for outright lying about internet speeds. (N.Y. Daily News) This is in addition to the multitude of attacks the workers are facing in contract negotiations. The company wants to eliminate pensions, funding for college, dental and other health benefits, and weekend overtime, among other takebacks. A one-day grievance strike of 1,700 workers in California and Nevada forced AT&T on March 22 to recognize that it can’t force workers to do jobs outside their skill set. Communications Workers Local 9003 won a victory: AT&T now has to assign properly trained staff at job sites and can’t make technicians work outside their job spec or job class. In unionspeak, job specs or job classes ensure that bosses can’t force you to do more than your expertise while keeping your pay at a lower scale. When the capitalist class tries to sabotage job specs, unions use the sharpest tool in their toolbox — the strike weapon. 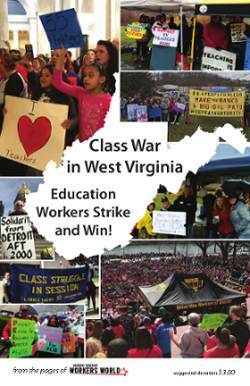 Last year, these same issues were won by Verizon workers in a historic 45-day strike. This tells you that even though gluttonous companies refuse to negotiate in good faith, unions are still the workers’ best defense. • When racist, misogynist, anti-worker Trump took the podium at the national legislative conference of the North America’s Building Trades on March 30, he was loudly booed; some delegates also held “Resist” signs before being escorted out. This surprising show of resistance came from a group of workers whom Trump assumed were in his camp, addressing them as “the backbone of America.” (Alternet, April 4) Thanks for defending workers, NABTU! • Freestate Electrical, a Brotherhood of Electrical Workers Local 26 signatory contractor, sued the Trump organization for failing to ante up $2 million in payment for its work turning the Old Post Office Building into a luxury Trump hotel. (Fortunately, hundreds of IBEW workers who did award-winning work have been paid.) Four other contractors have also sued over their work on the conversion, for a total of nearly $5 million in unpaid bills. (ibew.com, March 8) Pay up, Wage Thief in Chief!